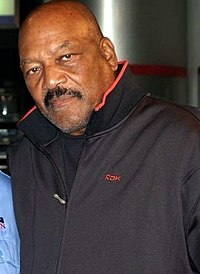 James Nathaniel Brown (born February 17, 1936) is a former professional American football player and actor. He was a running back for the Cleveland Browns of the National Football League (NFL) from 1957 through 1965. He is thought to be one of the greatest football players of all time. An actor, Brown is known for his role as Byron Williams in Tim Burton's 1996 movie Mars Attacks!. Brown was born in St. Simons Island, Georgia. In 2002, he was named by The Sporting News as the greatest professional football player ever. This page was last changed on 6 January 2019, at 23:59.